George Boole (1815-1864), considered the father of symbolic logic, demonstrated a method of expressing logical processes using algebraic symbols. In his “Derivation of the Laws,” he spells out the connection between Aristotle’s “principle of contradiction” and the “laws of thought” governing logical procedure. These laws, known as Boolean operators, govern the operation of the circuits and software of our digital culture. Intentions In reading of George Boole’s life and work, I was impressed with his commitmnents and interests, which ranged from classical learning and social concern to poetry. For myself, being neither a scientist nor a mathematician, I was surprised to learn that knowledge of classics informed his work with algebra. George Boole confirmed, for me, the value of maintaining continuity with the past and being open to renewal by the insights and work of those who have preceded us. 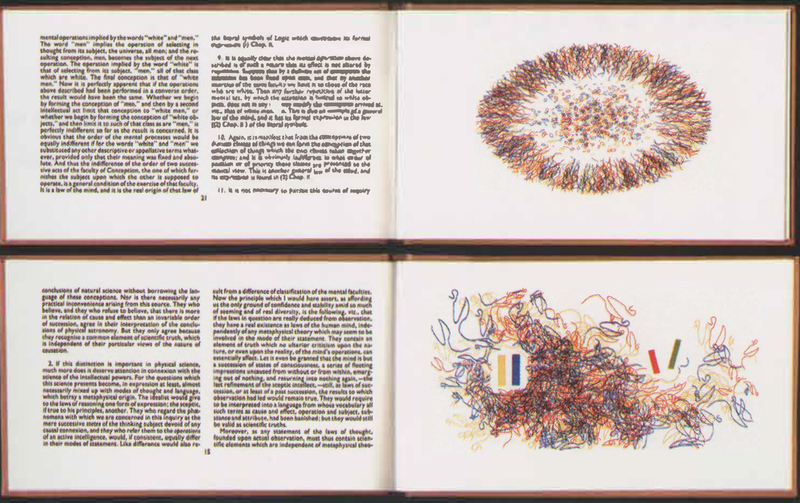 This edition attempts to honor him with illustrations created with algorithmic procedures that embody his theories. All of the drawings and brush work for this edition were executed in my studio with original coded procedures. Since these procedures are informed byBoolean operations, the illustrations are descended, to some degree from his pioneer work. They are, to some ex1ent, expressions of Boole on Boole.